A Tree Planted Near Running Waters | Sr. Maria-Walburga Schortemeyer O.S.B. Historically today is the feast of St. Walburga, sister of Sts. Willibald and Winebald. She became a nun at Wimborne in Dorset under St. Tatta and followed St. Lioba to Germany at the invitation of St. Boniface. 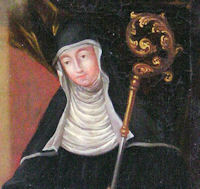 She died abbess of Hiedenheim, whence her relics were translated to Eichstatt. St. Walburga was born around 710. She is the daughter of St. Richard and the niece of St. Boniface. When St. Richard set out for a pilgrimage to the Holy Land with his sons, Ss. Willibald & Winibald, he entrusted 11 year old Walburga to the monastery school at Wimborne. She remained as a nun, spending a total of 26 years there. When St. Boniface put out an appeal for nuns to help him in the evangelization of Germany, St. Walburga answered the call. On the way to Germany, there was a terrible storm at sea. Walburga knelt on the deck of the ship and prayed. The sea immediately became calm. Some sailors witnessed this and spread the word that she was a wonderworker, so she was received in Germany with great respect. At first, she lived at Bischofsheim, under the rule of St. Lioba. Then she was made abbess at Heidenheim, near to where her brother, Winibald served as an abbot over a men's monastery. After his death, she ruled both monasteries. She worked many miracles in the course of her ministry. She wrote a biography of her brother, Winibald, and of Willibald's travels in Palestine, in Latin. She is regarded as the first woman author in both England and Germany. On September 23, 776, she assisted Willibald in translating the uncorrupt relics of their brother, Winibald, to a new tomb in the church at Heidenheim. Shortly after this, she fell ill. Willibald cared for her until she died on February 25, 777, then placed her next to Winibald in the tomb. After St. Willibald's death in 786, people gradually forgot St. Walburga and the church fell into disrepair. In 870, Bishop Oktar was having Heidenheim restored. Some workmen desecrated Walburga's grave. She appeared in a dream to the bishop, who then translated her relics to Eichstadt. In 893, St. Walburga's body was found to be immersed in a mysterious sweet-smelling liquid. It was found to work miraculous healings. The liquid, called St. Walburga's oil, has flowed from her body, ever since, except for a brief period when the church was put under the interdict after robbers shed the blood of a bell-ringer in the church. Portions of St. Walburga's relics have taken to several other cities and her oil to all parts of the world.